View cart “Laser Red Line 5mW Module” has been added to your cart. The LCD2004 20×4 Blue LCD Display provides a 20 character x 4 line LCD with parallel interface for control by a uC. These displays are straightforward to use and are a great way to provide a user interface on many projects where you need more info than simple LED indicators or 7-Segment displays can provide since these are full alphanumeric displays with 4 lines of 20 characters each for a total of 80 characters which is a fair amount of info. For an interactive display, pairing this type of display with a rotary encoder to navigate and select menu items on the display can provide a very nice user interface. The display is composed of a 20 character x 4 line LCD display with a blue backlight and white characters. Each of the characters are composed of a 5 x 8 dot matrix for good character representation. Custom characters can be defined and used with the display. The backlight has a VO (Display Contrast) input for connecting a potentiometer for adjustment of the contrast of the display for best viewing. The potentiometer can be somewhere in the 10K-50K range and should connect between 5V and ground. The wiper output of the potentiometer feeds the VO pin with a variable voltage that sets the contrast. If this is not adjusted correctly the display may not show any characters or solid blocks may be displayed. The backlight is powered off the A (Anode) and K (Cathode) pins. Normally 5V is applied to ‘A’ and ground to ‘K’. The backlight includes a 51 ohm current limiting resistor, so an external resistor is not required. This display incorporates an parallel interface that can operate using an 8-bit (byte) mode or a 4-bit (nibble) mode. 8-bit mode uses data pins D0-D7 and 4-bit mode uses the upper data pins of D4-D7. 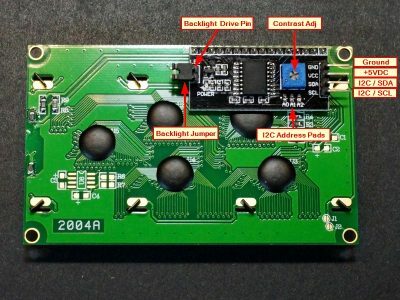 In practice, the 4-bit mode is normally used as it saves 4 pins on the MCU and maximizing communication speeds with the display are generally not a concern. The LiquidCrystal.h library makes the difference between using the two modes transparent to the user. 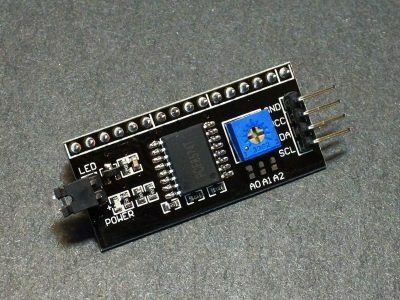 If it is desirable to minimize the pins used on the MCU even further, check out the version with an I2C interface down below which uses only 2 pins plus power and ground. Connection to the display is via a 16-pin header. 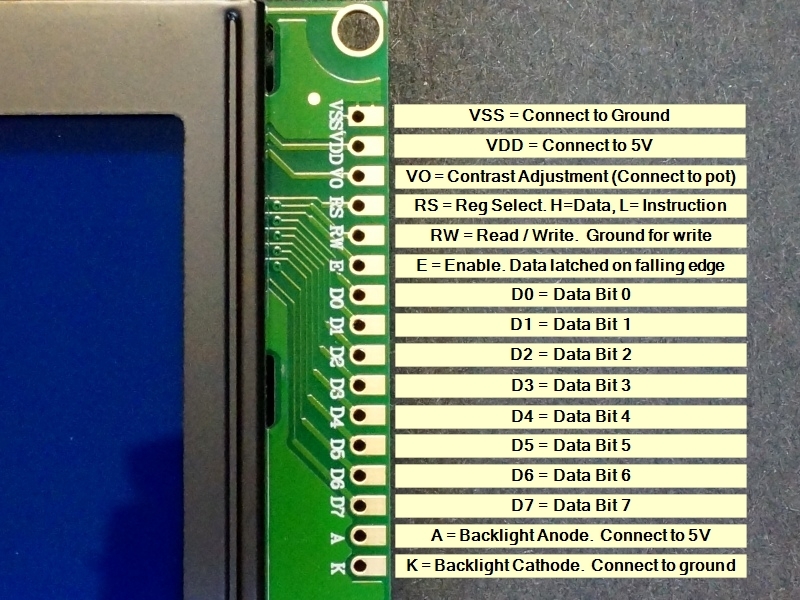 VDD = Connect to 5V. This can come from the MCU or be a separate power supply. RS = Register Select. Selects the command or data register. A logic LOW = Command, HIGH = Data. RW = Read / Write. The display is a write only device. This pin is grounded to keep it in write mode at all times. A = Backlight Anode. Connects to 5V. The module ships with the male header strip loose. This allows the header to be soldered to the top or bottom of the module depending on the planned use or wires can be used to make the connections. For breadboard use, put the headers on the bottom. Soldering is easiest if the header is first inserted into a solderless breadboard to hold it in position and keep it aligned during the soldering process. These are good quality modules and should be in the parts bin of any hobbyist. Because of the interactivity they provide, they are both fun to play with and useful for more serious projects. The software below uses the built-in Arduino “LiquidCrystal.h” library to show the functionality of the module. Connections to the module are outlined in the program comments. The MCU data lines used can be changed and redefined in the following line if needed. A potentiometer is required between 5V and ground to feed the VO line to set the display contrast or else the text may not be visible. Initialize the LCD and print a simple message to it. Then increment a counter on the 4th line every second. Connect VDD to 5V and VSS to ground on the Arduino. 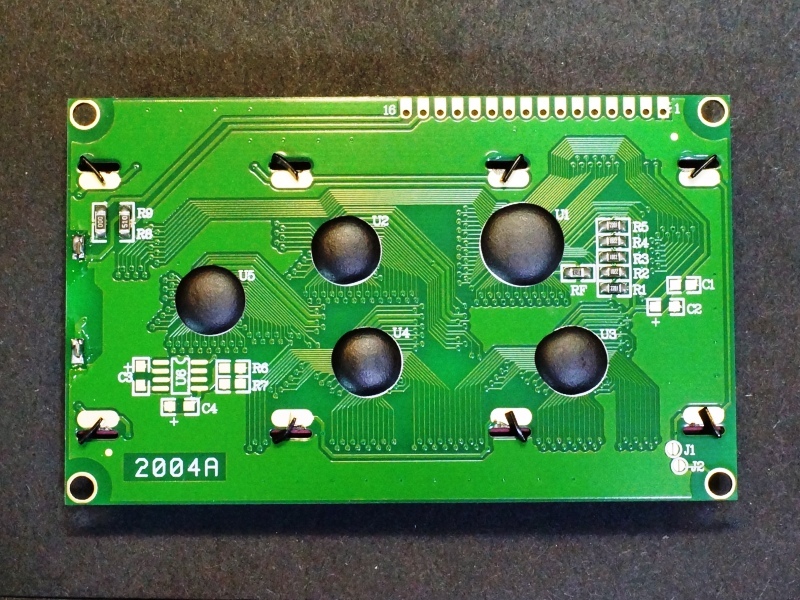 The back of the board contains the electronics, so some care should be used to avoid possible shorting if placed on a metallic surface. 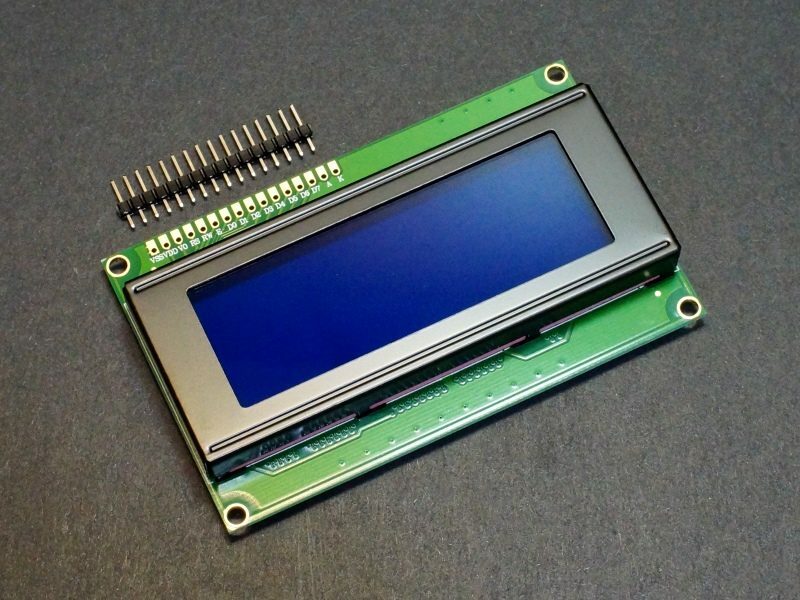 This LCD I2C interface adapter board can be added to a 16 x 2 or 20 x 4 character LCD display with a standard parallel interface to make it I2C compatible.